The one change you should consider making to your dog’s diet this year has to do with kibble. You should re-think kibble! Feeding your dog just kibble is not good enough and doesn’t supply your dog with sufficient nutrients to maintain optimal health and longevity. There are a whole host of issues associated with mass-marketed kibble (dry food) that can negatively effect your dog’s health. What is scary is that it can actually take years before an outward problem manifests from poor nutrition. From having owned a pet store, we know that many dog owners feed kibble exclusively, and many of our customers would often say that their dog is doing just fine on this food. While your dog could appear to be doing just fine, inflammation could be building on the inside of the body. One day your dog could show symptoms of a frightening disease that won’t go away, and you may ask yourself why this is happening all of a sudden. The reality is that the health issue took a long time to build up on the inside of your dog’s body. When it became too much for the body to handle, the disease manifested, and symptoms started showing up on the outside, or in the behavior of the dog. More specifically, the problem started with inflammation on the inside a long time ago. Health conditions like gastrointestinal issues, skin irritations, chronic yeast infections, joint issues, obesity, behavioral issues, heart disease, autoimmune diseases, and even cancer all have one thing in common – they all result from inflammation that originates in your dog’s body. While genetic predisposition and stress can also play a role in developing health issues, diet definitely plays a critical role in promoting good health. Good nutrition is the key to a healthy immune system and resistance to diseases. Kibble is the most highly processed form of commercial dog food. Not only does the cooking at high temperatures destroy the nutrients and enzymes in the food, many manufacturers use inferior ingredients which decreases the nutritional content to begin with. A synthetic vitamin premix is often sprayed on the kibble at the end of the processing to meet the nutritional adequacy guidelines as set forth by the Association of American Feed Control Officials (AAFCO). But just because a pet food meets AAFCO’s nutritional adequacy guidelines, that doesn’t mean it promotes optimal health in your dog! Corn, wheat and soy are common protein sources in mass-marketed kibble brands because they are cheap to produce. These cheap proteins can cause a host of health issues in dogs including obesity, inflammation, skin problems, thyroid problems and leaky gut syndrome. Commercial pet foods often contain food additives such as artificial colors, flavors and palatability enhancers; chemical preservatives; emulsifying agents; stabilizers/thickeners, and others that are unhealthy for your pet. 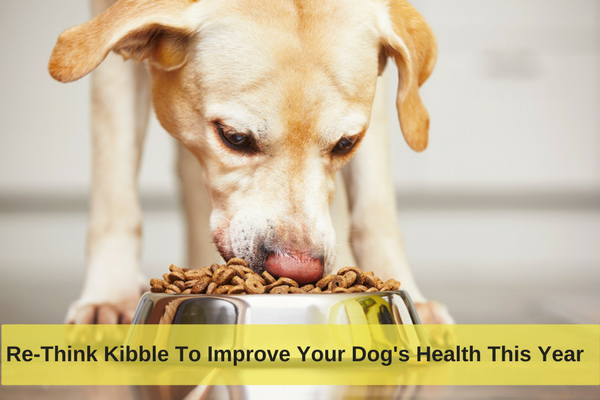 Kibble also requires starch to bind it together, and manufacturers often use high-glycemic starches that can trigger the body to produce a chronic inflammatory response. Premium and Holistic Kibble – Is it Really Better? Dog owners often proudly state that they are feeding a “premium” or “holistic” kibble. Are the so called premium or holistic brands really better and healthier for your dog? Sorry, but most of them are not. Even though there are manufacturers of brands that use better ingredients to make the kibble, in most cases the food is just as highly processed as the inferior quality brands you typically find at the grocery or big box stores. This processing can counteract the functional effect of the premium ingredients that might have gone into the food. No matter how pretty the pictures or catchy the marketing slogans on the bags are, fact is that no processed food can ever be as nutritious than the ingredients that make up the food if they were prepared fresh. 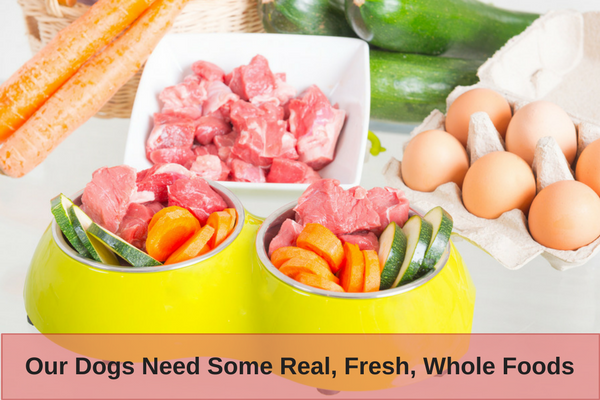 Dogs need real food, fresh whole foods, or at least minimally processed foods. Dogs need functional foods, which are nutritional ingredients that help fight inflammation and promote healthy functioning of the organs to manage and prevent disease. Processed foods are inflammatory foods, for humans as well as pets! That’s why we want you to re-think kibble. Homemade diets is what we should ideally be feeding our dogs because we are in control of the quality of the ingredients and know exactly what our dogs are eating when we prepare our own food. If you are not able to home-prepare your dog’s food, whether it is cooked or raw, then you might want to consider canned/wet foods, or at least add some to your dog’s kibble. Canned foods have a much higher protein content than kibble, and the meats are less processed and therefore closer to their natural state than the meats contained in kibble. Because canned foods are pressure sterilized and sealed, manufacturers do not need to add harmful chemical preservatives. Canned foods are typically free of artificial colors and flavors as well. Dehydrated and freeze-dried foods are also a better choice than kibble because these products are made with raw, fresh ingredients such as meats, vegetables, fruits and herbs. The water is removed to make the product shelf stable, and when rehydrating with water prior to feeding your dog, the food closely resembles its original form. I understand that for some of you kibble may be the only choice. I also know that older dogs or foster dogs that are used to eating only kibble, may be hard to change over to another type of food. But there are still steps you can take to improve your dog’s diet. You can can follow our tips below for choosing a better kibble, and tips for adding some nutrients to kibble to improve the quality of your dog’s diet. Make sure the first ingredients listed are high quality proteins. Protein is the most important nutrient in a dog’s diet because he cannot survive without it. It is important to avoid choosing foods that have cheap, grain-based proteins listed as the first ingredients. Ensure that the specific protein source is named such as lamb, duck or venison rather than unidentified “animal” proteins or generic sources such as “poultry” or “meat”. Select a food with novel proteins such as bison, duck, goat, rabbit or venison to minimize the risk of food intolerances. Look for foods with the least amount of ingredients listed on the bag because the longer the ingredient list is, the least “natural” the food tends to be. Select grain-free and gluten-free foods, especially if your dog already has digestive disorders or itchy skin issues which may be signs of food intolerances. Choose foods with natural preservatives such as vitamins C and E rather than chemical preservatives such as BHA, BHT or ethoxyquin. Do not choose foods containing by-products such as “beef by-product meal” or “chicken by-product meal”, etc. Many pet owners believe that the kibble diet they are feeding their dogs is complete and balanced because that is what it says on the bag. The reality is that most kibble diets are lacking healthful vitamins, fats, enzymes and probiotics, which are lost with heating and processing. 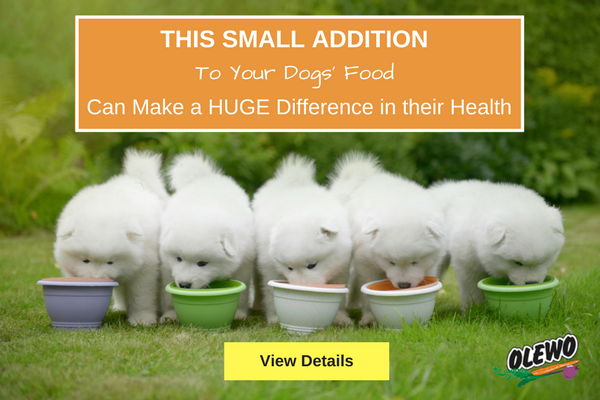 The simple addition of the four suggestions listed below will drastically increase the nutrient content of your dog’s meals and can make a real difference in the health and quality of life of your dog. Just give it a try and you will be amazed at the remarkable changes you will see in your dog in just a few weeks. Chicken is a favorite in our house and I cook it once or twice a week. I feed the raw necks and organ meats from the packet inside the chicken to my dogs. Then I cook the whole chicken just in plain water (no salt, onions, etc). I use the cooked chicken to make chicken salad, chicken and dumplings, or other dishes. I use the rest of the cooked “plain” chicken to top off the dogs’ meals. Wild alaskan salmon is also on the weekly menu and I always make some extra for my dogs. Again, I cook the salmon in “plain” water, and just like in the example with the chicken, use it to make a variety of dishes for myself, and then use the rest of the “plain salmon” to top off the dogs’ meals. Sometimes I top off their meals with quality canned wild alaskan salmon. Broccoli is another favorite of my dogs. I steam the broccoli to preserve most of its nutrients, and while I prefer to eat the broccoli florets, my dogs a very happy to eat the part that comes from the stems. This may surprise you, but the broccoli stems actually contain more nutrients than the florets from the head of the broccoli! Blueberries have always been one of my favorite fruits. They are a true superfood and are also anti-inflammatory. I give a few of them to my dogs every time I eat them. Note that I said a “few” of them. Dogs only need a small amount of vegetables and fruits to reap some health benefits, and they should receive less fruits than vegetables because fruits have a higher natural sugar content. Whole food vitamins can be obtained from a variety of different foods when fed in their unadulterated (unchanged) form as intended by Mother Nature. The only food that has any real nutritional value is a whole food. While not an essential nutrient, functional carbohydrates such as vegetables, fruits and gluten-free grains are packed with vitamins, minerals and phytonutrients (phytochemicals) that promote optimum health. Carrots and Red Beetroot are two of the most nutrient-rich vegetables and we truly don’t know a better source of whole food vitamins for your dog than Olewo Carrots and Olewo Red Beets. Olewo dehydrated vegetables are not a vitamin or supplement product, it is the real thing! Each is a “1” ingredient product, meaning either 100% carrots, or 100% red beetroot, nothing else added, and preserved naturally through dehydration. Olewo is powerhouse nutrition with all the vitamins, minerals and antioxidants your dogs needs to promote optimal health. The vegetables are especially prepared for dogs to be able to absorb, assimilate, and utilize the amazing nutrition. Probiotics and enzymes are nutrients that are missing in kibble because the heating and processing destroys bacteria, both good and the bad. Probiotics, (good bacteria) balance the gastrointestinal flora so the gut can function normally. Enzymes help break down food for proper digestion. I personally feel probiotics and enzymes are always beneficial to add to your dog’s diet regardless of whether you are feeding kibble to not. 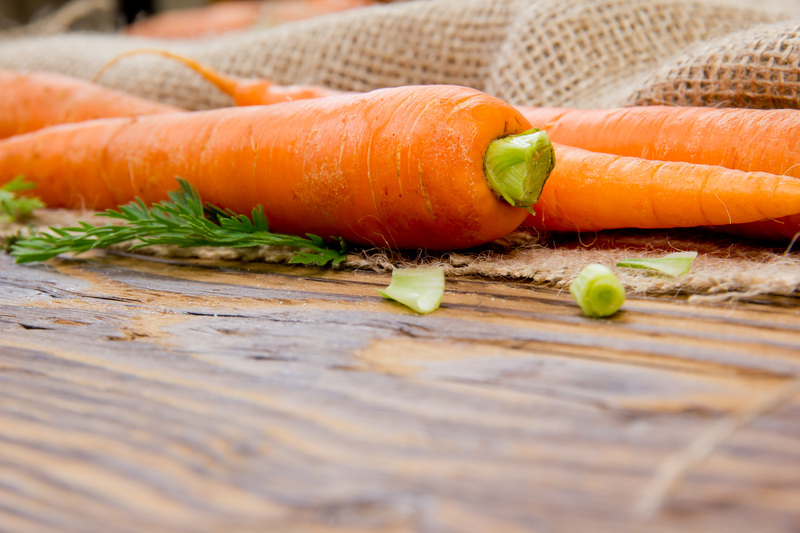 While I feel that I am providing my dogs with healthy foods, and I am adding Olewo Carrots which promote a healthy gut, I have always added a probiotics and enzyme product to my dogs’ meals to provide additional support to their intestinal flora. Gut health is extremely important because it effects your dog’s entire body. Fatty Acids is another important nutrient to add to your dog’s diet because most kibble diets are lacking healthful fats, which are lost with heating and processing. Most plant-derived fats contained in commercial pet foods provide omega-6 and omega-9 fatty acids which are in general pro-inflammatory. Omega-3 fatty acids on the other hand are anti-inflammatory. Adding a quality fish oil is a great way to add healthy omega-3 fatty acids. I personally prefer a sardine and anchovy oil because small fish contain less toxins, and sardine and anchovies have an even higher omega-3 content that salmon for example. Instead of the fish oil, some days I add a can of either Sardines or Mackerel to my dogs’ food, and they absolutely love it! Make sure to buy those products in spring water with no salt added. It’s a New Year, a good time to re-think our nutrition, and the nutrition we provide for our pets. They are counting on us!